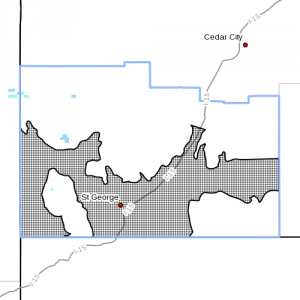 WASHINGTON COUNTY — The National Weather Service in Salt Lake City has issued a “High Wind Watch” for St. George, Utah’s Dixie and Zion National Park in effect Saturday evening through Sunday evening. The affected area includes Washington County outside of the St. George area and specifically: the Interstate 15 corridor from Leeds to the Iron County border; near the St. George Municipal Airport; and western Washington County along the Bull Valley and Beaver Dam mountains. High winds will develop around midnight Saturday and last through early afternoon Sunday. Winds will likely diminish Sunday afternoon only to increase once again Sunday evening. Strong crosswinds are forecast along west-to-east routes of Interstate 15. These winds may cause hazardous driving conditions for trucks and trailers. Wind-sensitive operations will likely be impacted. Northeast winds of 30-40 miles per hour are expected with gusts exceeding 60 mph. A “high wind watch” means there is the potential for a hazardous high wind event. Sustained wind speeds of at least 40 miles per hour or gusts of 58 miles per hour or stronger may occur. Windmill tax scam farms will be busy today.